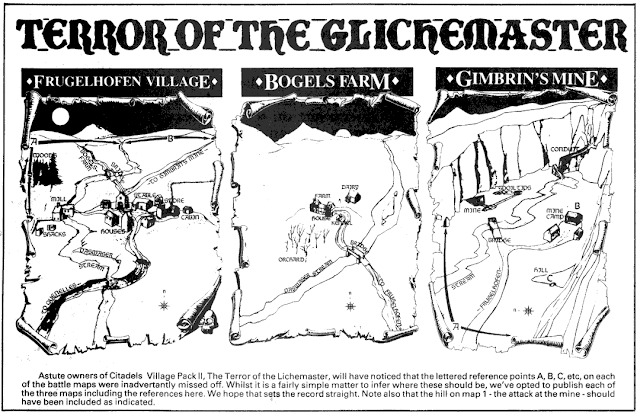 Welcome to the finale in my series on The Terror of the Lichemaster, the classic campaign published in 1985 for Warhammer 2nd edition. 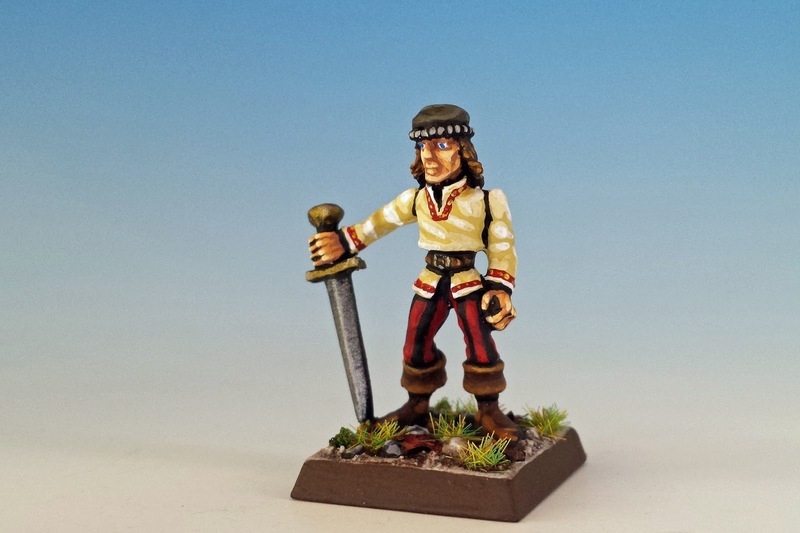 To assist other hobbyists, I've created a permanent gallery of all my painted miniatures for Terror and, like my other galleries (hello Talisman! ), you can find it on the menu on the right. I have not yet played through the campaign. Will the Lichemaster's Faustian bargain lead to his downfall? Or will he consume Frugelhofen with magic and malice? To finish things off this series of ten posts, I thought I'd share some ideas on how to run the three battles that compose the campaign and decide Kemler's fate. It was 50 GBP (in 1987 currency) for all 123 minis, equal in today's currency to about 132 GBP or $165 USD. When I saw that, I nearly choked but instead I perished of heart failure. Gimbrin Finehelm alone cost me quite a bit more than that. Sigh... I guess that's the way of all collectibles. They start out as junk and time alchemizes them into gold. Well, back to the game! 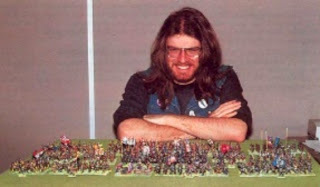 One of the core principles of the Oldhammer movement is a relaxed approach to game balance. As Zhu wrote in the Oldhammer Contract, "As the Spartans will tell you, warfare has never been about perfectly matched armies squaring off at each other, and fantasy warfare even less so." You can see this axiom in the Lichemaster scenario itself, where it's never clear who is really the underdog, and there's certainly not mention of the point values of each force. What conclusions can we draw from these sums? It seems to me that the first 2 scenarios favour the humans/dwarves in a toe-to-toe fight, whereas the final battle is more evenly matched. But in all these scenarios, the forces of good will rout if they fail a single fear test or get pushed back in battle (since skeletons & zombies, of course, cause fear). This vulnerability to fear is especially pronounced in the first 2 battles, where the forces of good are so few in number. Thus these two battles will most likely hinge on just a couple of dice rolls. The fact that these battles might come down to a few fear rolls brings me to my last point. As much as I love Warhammer Fantasy Battle, I'm not sure it's the ideal rules set to bring to life The Terror of the Lichemaster. The first two scenarios are on a much too small scale, involving only 5 or 7 models for the forces of good. 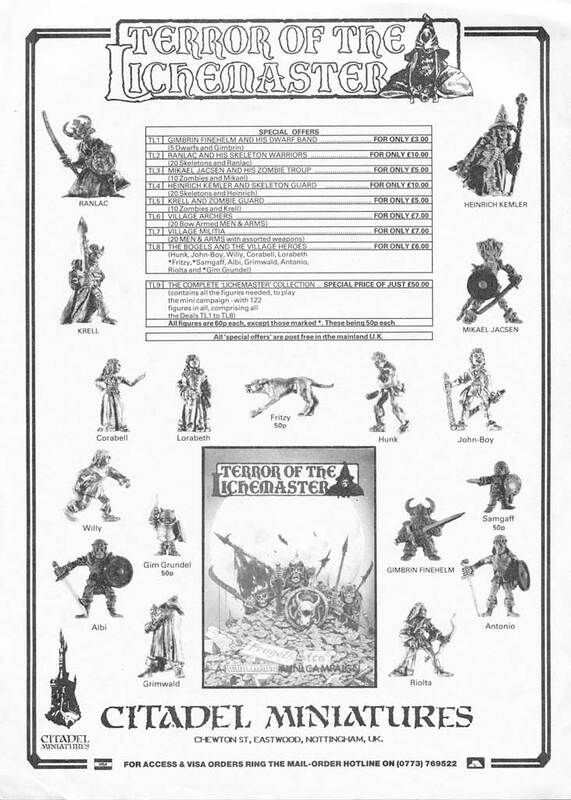 (In my view, this reflects the fact that in the early days, Games Workshop branded WFB as half role playing game and half war game). Even the last set piece battle seems a little awkward for WFB since each side is unlikely to have more than 2 or 3 massed units, and that doesn't leave much room for strategy or maneuver. And finally, as I already mentioned, the rules for fear in WFB are so unforgiving that it might mean that the battles end before one side can even complete a charge action. It seems a shame that a scenario that takes years to collect and months to paint might be over in a few minutes. So what are the alternatives. 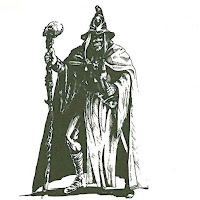 Whiskey Priest and Warlord Paul once made the excellent point that Mordheim (aka Warhammer Skirmish from the 6th edition of the rules) would be a better way to implement small-scale scenarios like the first two battles in Terror of the Lichemaster. This option requires little modification from the existing rules, and allows the players an easy transition from using skirmish rules for the first two battles and then slugging out a traditional, full-scale Warhammer Fantasy Battle for the finale. I think Saga is another strong contender. 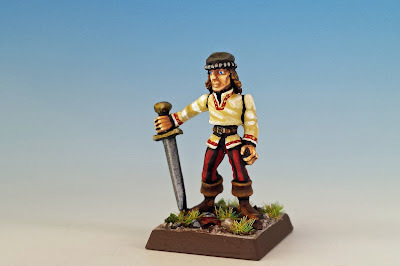 Although traditionally a historical wargame, Saga boasts a special expansion for an undead faction ("The Revenants") led by a necromancer who bears a striking resemblance to Heinrich Kemler. (All the minis for this expansion are sculpted by Citadel alumnus Bob Naismith). In scale Saga is perfect, especially for the first two battles of Terror. And Saga's unique rules would allow for a dramatic, story-driven battle. 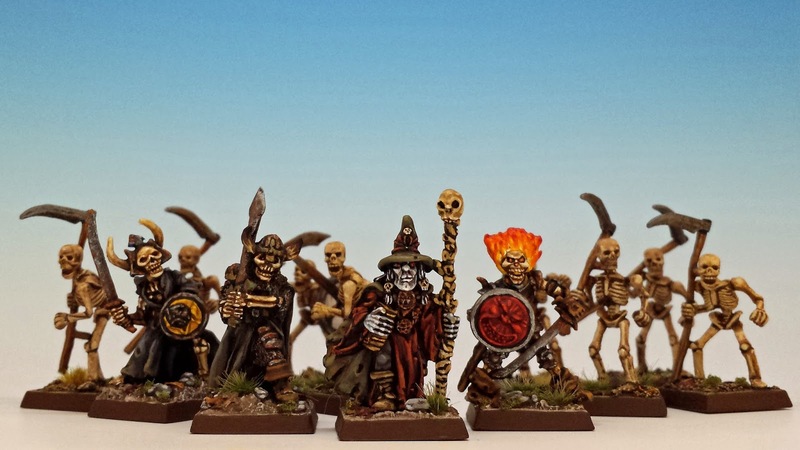 By using Saga instead of Warhammer, the undead lose the game-ending power of fear, but gain the power of re-animating the fallen as they die on the battlefield. Finally, another option is Otherworld Miniature's Fantasy Skirmish Rules. I'm a big fan of this rulebook (some of the artwork in the book was devised by Oldhammer stalwart Zhu Bajiee). By using this system, the players would be allowed a broad scope to customize and personalize each of the personalities in the campaign. 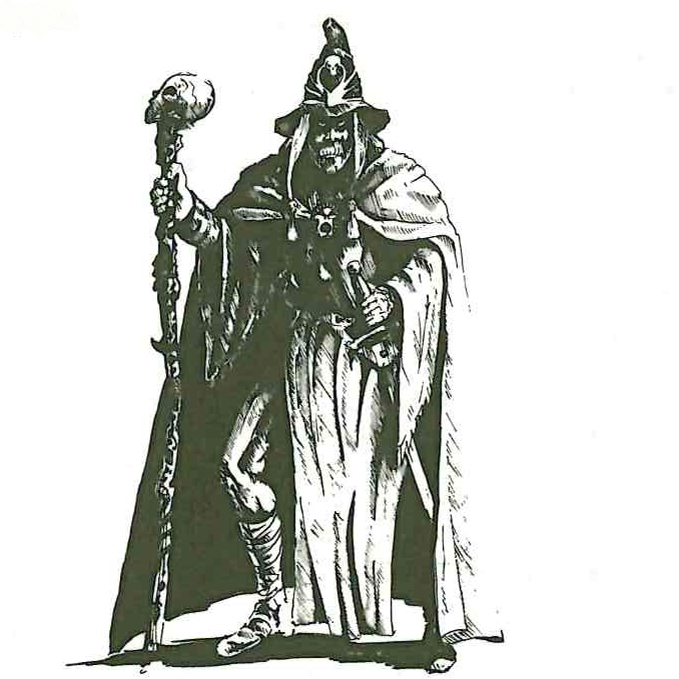 It would take a lot of time to reconfigure Terror of the Lichemaster for Otherworld, but I think the effort would be repaid with rich dividends. 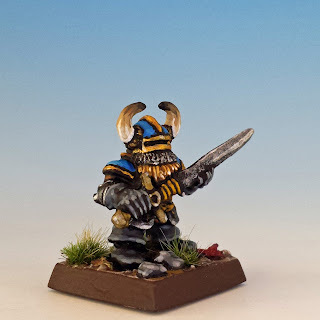 * For rules-junkies like myself, I will add a few observations about Warhammer points systems. 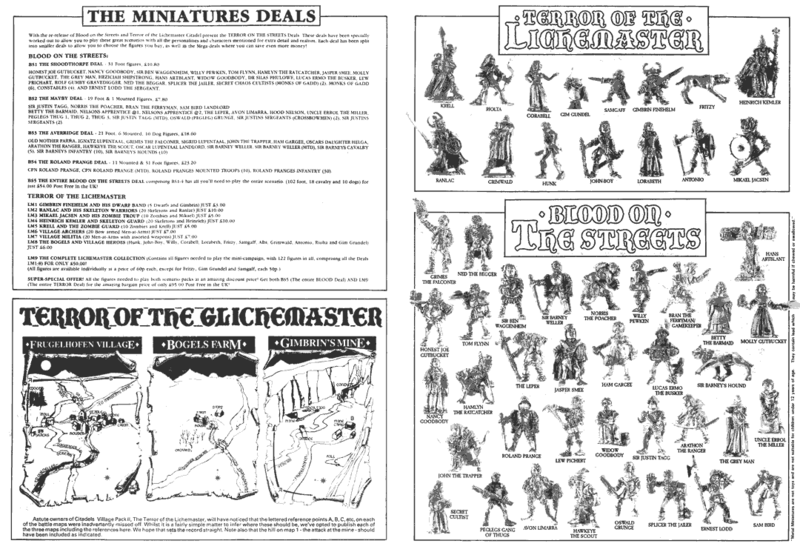 When applying the 3rd edition point system, I've included the gloss contained in Warhammer Armies (1988) that equipment costs are not multiplied if the base figure is 10 points or more. Even with that gloss, it's interesting that the points calculation from 2nd edition to 3rd edition doesn't change much when examined from a macro scale, except that skeletons and zombies are cheap in 2nd edition and become more expensive in 3rd edition (much more expensive for skeletons, leaping by 2.5 points for a base model to 10 points). Also, magic users and magic items are very expensive in 2nd edition and become cheaper in the 3rd editions (which is why Kemler's force is worth less points in the 3rd edition, even though his skeleton guard leaped in price). 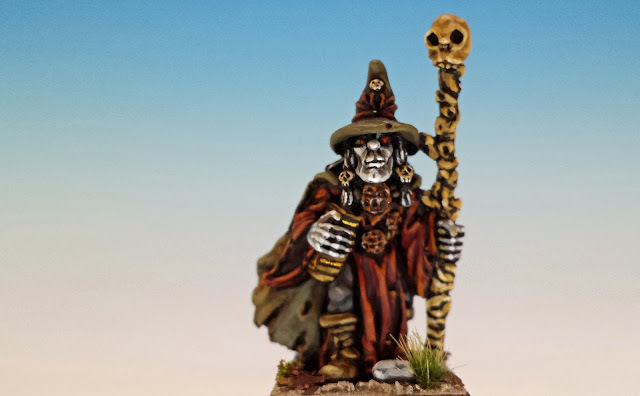 Wonderful minis, and this lich looks so mysterious and powerful, I love it! Never tell me the cost. I like the idea of using a different rule set to get a better feel for the game. As much as I am nostalgic for 3rd, I recognize that it can deliver a clunker of a game. I am going to try to play more Dragon Rampant myself. I've missed out on Frostgrave thus far. It's been brought out at the last few Oldhammer things I've been at, but I've been too busy with other games to get any playtime in. The initial turn off was thinking about winter basing. I know I don't have to but it just bugged me a little. I also intend to give the winter basing a miss. I always like being able to use my miniatures in as many different games/settings as possible. Wow you really went to work on this one! LOL Might I suggest Donnybrook as a possibility for the rules. I'm going to keep championing this ruleset, as I think it's amazeballz! On your recommendation, I will check out Donnybrook. As I was saying to Sean, I'm still searching for the perfect skirmish rules set. Having played the return scenario after these, I'm eager to see your take on the first ones ! Sully I need this in my life right now! More gaming with beautiful figs. I would love to do that with you. We need to chat about perhaps getting a third player so that I can GM. I can't believe I got mentioned twice in the same post, about completely different things! lol! I think playing the campaign without using WFB 2nd Edition - the edition it was, after all, designed for, would be something of a lost opportunity. It's not as 'clunky' as 3rd (no complex manoeuvres - which should only really apply to large bodies of troops). A minor thing, but perhaps significant for ToTL the Fear rules are slightly different between 2nd and 3rd - so for example, in 2nd there is no need to take a Fear test for shooting, wheras in 3rd, a test needs to be made if within charge range. The chances of Gimbrins (lovely paint there!) crossbow armed Dwarves are somewhat handier there. They also test - 2D6 at Cl 10 - if my maths is right, that's only an 8% chance of suffering fear effects (and a 92% chance of rallying)... also the Bogels victory conditions are favourable to the strategy of running away! Regards points, 3rd Edition only monkeys around with a few things - skeletons, halflings, snotlings, but largely it's the same system (although not expressed as granularly). I can appreciate the reasons for some of the 'fixes', but don't agree with them. All undead suffer utter defeat if their leaders are taken out, a severe weakness that doesn't get accounted for in the 'fixes', and not all 'fear' giving creatures got the same increase as skeletons. Anyway, some food for thought - look forward to reading about the results, whatever system you use to tackle the beast with! Your point about the unclunky nature of 2nd edition is also well taken. I'll keep you posted about how it turns out. Dragon Rampant is a fun simple rules set that could work. Frostgrave too, though more suited to no more than 5-10 figs per side. Rather envious of folks like yourself who can tackle these type projects with like-minded pals! Well, my network of Warhammer friends in Toronto is thin, consisting only of 24_C. I've got lots of boardgame buddies, but not many who share my interest in old GW games. Amazing blog! Thanks for the interesting posts and the pics of beautiful minis. I'm really glad you like the blog! I love writing it. I am very happy that you appreciated the Faustus quote!